Duncan Wentworth once tried his hand at rescuing a damsel in distress long ago, and he's vowed he'll never make that mistake again. Yet when he comes across a stranger in the poacher-infested woods of his estate, decency compels him to offer the lady aid. Matilda is whip-smart, she can read Duncan's horrible penmanship, and when she wears his reading glasses all Duncan can think about is naughty Latin poetry. 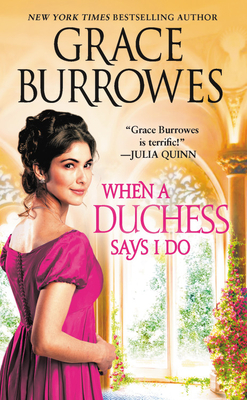 Widowed duchess Matilda Wakefield can't entrust her secrets to Duncan without embroiling him in the problems that sent her fleeing from London, but neither can she ignore a man who's honorable, a brilliant chess player, and maddeningly kissable. She needs to stay one step ahead of the enemies pursuing her, and falling into Duncan's arms is a distraction she can't afford-or they'll both pay the price. BookPage "2019 Most Anticipated Romances"
Bookish "Spring 2019 Must-Read Romances"
"An unusual pair of smart and worldly but reticent lovers; a modern sensibility about themes of consent, class, and disability; and a surprising and adventurous plot make Burrowes's latest Rogues to Riches Regency satisfyingly relatable nerdy escapism...will warm readers' hearts to the core."